It’s seems this month has been plagued with crisis after drama this month. I find it ironic in the month I am trying to focus on emergency preparedness that I have been side-railed by my own personal emergencies. But I am at the end of my series on emergency preparedness. I hope you and your families have found it beneficial and have taken the opportunity to get yourself ready for any emergency situation. If you have started, that’s great because you are not putting it off. If you have finished your kits and binders, bravo! 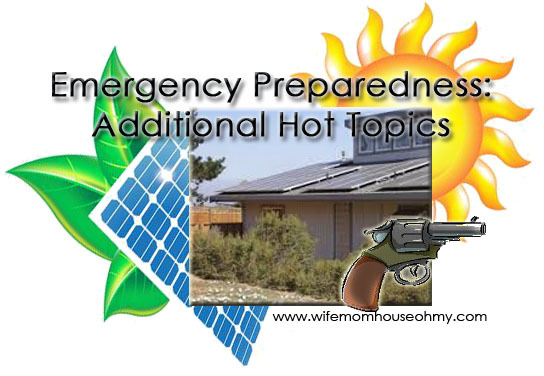 This last post on emergency preparedness is more about “Hot Topics” per say. Things you may want to consider but are beyond the scope of my knowledge or these posts. In a true widespread emergency, our home personal alarm systems are probably not going to do much for us. But during a personal emergency they can save your life. Alarm systems today no longer tap into your electrical system so they continue to run even when electricity is out. Fire alarms are wired in so even if you are not home, alarms are sent out to local fire departments. This could mean saving you if you are asleep, your pets if you are gone and your home since early response is the difference in minor and major damage. Most alarms feature panic buttons and distress codes in case of break ins or home invasion scenarios. Plus, almost all come with the ability to be controlled by your cellphone. You can send distress signals, fire signals and even ambulance signals from your phone if need be. Most alarm companies offer discounts for installation and equipment with a contract for service and service can be as low as $20 a month. I work at home, and often my only company during the day is my “brave and mighty” little Yorkies and “fierce” Persian cat, who probably together might be able to take down, no distract, a 100 pound intruder. In other words, they wouldn’t be much help. There is something comforting about knowing I have the security of the alarm, especially when I am on the second floor. I grew up in the south where if you had a gun, be it hand gun or rifle, was not even a question. It was assumed. In fact, there were bumper stickers that said “I ride with Smith and Wesson”. Now I am not advocating going out and buying a gun to protect your family. Guns are not for everyone and there are some very good reasons to NOT have them in your home. But, I firmly believe if you decide to do so you need to first have prior AND proper instructions as well as multiple conversations regarding guns and gun safety with your family (especially children) well before you ever buy one. However, I do know that this is an option many people take and support their right to do so. (In fact in countries were gun control laws remove a regular citizens right to own munitions, crime tends to increase.) I personally won’t go into details on guns here but I was referred to a great site that I think does a good on the topic of firearms and self-defense, The Survival Mom. The site has guest bloggers and discusses a wide variety of topics including how to handle a home invasion or “active shooter” like those at Columbine or the Aurora Theater. One way to insure you have power during an emergency is through solar power. Solar power supplies and endless source of energy on a sunny day and can be stored for use later. And there are companies that you can either get technology that you lease for governmental credits as well as those that you can purchase as your own equipment. There are other sources of alternative energy out there. Depending on where you live these may or may not be feasible. Wind turbines, inverters, biofuel and alternative fuel powered generators available. I located this one site called Dwell and series of articles focused solely on building a zero-energy dwelling and retro fitting older ones to do the same. I found it a good resource in not only looking into alternative fuel sources for my home but also as potential ways to save on my existing energy costs. Sometimes you need or may want to take it the next level in preparedness. That’s where “The Sold Out After Crisis Survival Package” comes in. I am not an advocate of doomsday preparedness and I must personally say that I have not read/watched his product yet. I discovered him and his product while doing research for this series. However, his video presentation makes an interesting and good case for needing to take preparedness to the next level as well as potential things to consider as you do put your emergency kits together for long term disasters. I will be purchasing it, if for nothing else than the cost savings of making my own solar power source. (I am not affiliated with this product.) When I do, I will follow up with a better product review. In the future, I plan to put together an e-Book with these tips, forms and checklists to help those that need to become prepared, get there. I will also post an update with my finished kits and binders. My next post will be on a subject a little closer to home for us moms, “How to Recognize the Signs of a Heart Attack in Women”. Statically women tend to wait longer than men to seek help when experiencing a heart attack because the typically symptoms don’t always manifest in women. I think as moms and daughters we owe it to ourselves and our families to be fully informed. See you next post!